The Chinese People’s Liberation Army Navy Air Force (PLANAF) dispatched two Xian H-6G maritime strike bombers and one Shaanxi Y-9JB (GX-8) electronic warfare and surveillance aircraft through international airspace between the Japanese islands of Okinawa and Miyako in the East China Sea on April 1. The Japan Air Self-Defense Force (JASDF) scrambled fighter jets to intercept the PLANAF aircraft in response; Japanese airspace was not violated, according to the Japanese Ministry of Defense (MoD). This was the second JASDF scramble conducted against Chinese military aircraft in the East China Sea within 48 hours. On March 30, China flew four People’s Liberation Army Air Force (PLAAF) Xian H-6K long-range bombers, one Shaanxi Y-9JB electronic countermeasures aircraft, one Tupolev Tu-154MD electronic intelligence plane, and at least two fighter jets over the Miyako Strait — a principal entryway for the Chinese Navy into the Pacific Ocean. The Miyako Strait is a critical chokepoint, the Chinese seizure of which could delay third party intervention and secure the so-called first island chain in the event of a conflict with the United States and its regional allies. The Chinese People’s Liberation Army Navy (PLAN) also deployed two Type 054A Jiangkai II-class guided-missile frigates and an oiler from the PLAN’s East Sea Fleet to the Western Pacific on March 28, according to the Japanese MoD. The ships were spotted crossing the Miyako Strait last week. However, it has not been established whether the Chinese aircraft made contact with the PLAN warships on March 30. 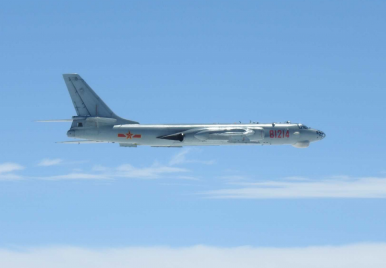 The April 1 scramble constitutes the JASDF’s second intercept of a PLAAF/PLANAF bomber formation over the East China Sea in 2019. H-6G maritime strike bombers are a derivative of the Soviet-era Tupolov Tu-16. The PLA South Sea Fleet currently operates an H-6G regiment consisting of approximately 14-18 aircraft. The bombers intercepted on April 1 appear to have not carried any payload under their wings. JASDF aircraft also conducted a scramble against a Russian Navy Ilyushin Il-38N “Dolphin” maritime patrol and anti-submarine warfare aircraft over the Sea of Japan on March 27.